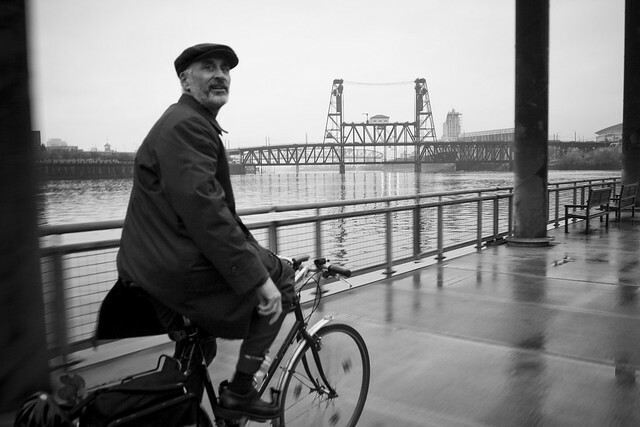 Roger Geller is the Bicycle Coordinator for the City of Portland. He's in Melbourne at the moment, speaking at the Bike Futures conference. The Sydney Morning Herald has an article today about his visions for a bike-friendly Sydney entitled Sydney Can Be Saved. Roger is a great advocate for urban cycling and not least for Citizen Cyclists. He's also a pillar of rationality in a world of gear-fixated chaos. In one of his presentations he has a slide showing current helmet-wearing rates in Portland. Then he says, "Here's our goal for helmet wearing rates..." and then on the next slide it reads "0%". He has stumped many an audience with that. His point is creating such a well-developed network of bike infrastructure - like in the Netherlands or Denmark - so that helmets aren't deemed necessary. The man responsible for transforming Portland in the United States into a bike-friendly city says the same can be done for Sydney and Australia's other major cities. As the bicycle co-ordinator for Portland, Oregon, he's overseen the construction of 500km of developed bikeways. Almost 10 per cent of Portlanders now identify the bicycle as their primary means of transport. Mr Geller says his city started with a "zero bicycle culture" 20 years ago. "Bicycling was relegated to the strong and the fearless," the bicycling advocate told AAP. "The thing that changed it for us was political leadership back in the early 1990s." Now ridership is high and "inescapable", Mr Geller said. "People from all segments of society are riding - it's not just 20-year-old men." The change in culture has been so successful some 130 businesses have asked for on-street car parking in front of their shops to be removed and replaced with bike parking. Mr Geller rode Sydney's notoriously non-bike friendly streets earlier this week. Riding on the developed bike paths was "quite nice", he said. "But being off the developed bikeways it reminded me of riding in any large city - it's not for everybody." However, Mr Geller believes Sydney can be saved. The key is building more and more dedicated bikeways. "Technically there's no reason why you can't do it," he said. "If you look at cities like Amsterdam and cities throughout the Netherlands they're similar. "They are very small, they have very limited right of way, and still they're able to fit in facilities so that a third of trips are made by bike." Mr Geller said it wasn't a question of physical space but political and cultural will. Mr Geller is also using his visit to dispel the myth that it's tough to ride to work in business clothes. "There's an image that bicycling is sport and you'll work up a sweat," he said. "But that's just not the case. "If you can sit on a chair and get in and out of a car in a thousand-dollar suit you can easily sit on a bicycle seat and pedal at 15km/h." Mr Geller will deliver the keynote address at the Bike Futures conference on Thursday.